A new federal study finds bees are having a much harder time finding food in America's last honeybee refuge. 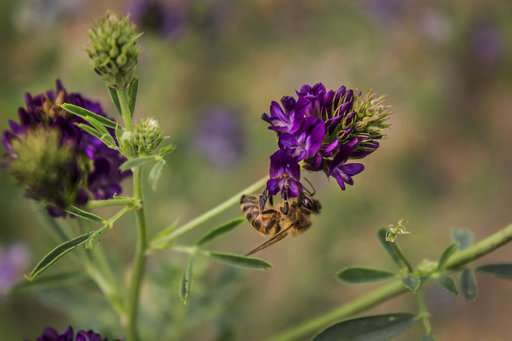 The country's hot spot for commercial beekeeping is the Northern Great Plains of the Dakotas and neighboring areas, where more than 1 million colonies spend their summer feasting on pollen and nectar from wildflowers and other plants. Clint Otto of the U.S. Geological Survey calculates that from 2006 to 2016, more than half the conservation land within a mile of bee colonies was converted into agriculture, usually row crops like soybeans and corn. Those don't feed bees. Otto says bees that have a hard time finding food are less likely to survive the winter.